1977 में, एलिज़ाबेथ ने अपने शासनकाल की रजत जयंती मनाई। राष्ट्रकुल में दावतों और आयोजनों का दौर चला। इन समारोहों ने रानी की लोकप्रियता को और स्थापित किया। अगला वर्ष उनके लिये बेहद चौंकाने वाला व दुखभरा रहा जब रानी के चित्रकार व सर्वेक्षक ऐंथोनि ब्लंट एक सामवादी जासूस निकला व उनके रिश्तेदार लुइस माउंटबेटन का आयरिश रिपब्लिकन सेना द्वारा कत्ल कर दिया गया।. ↑ एडवर्ड्स, फ़िल (31 अक्टूबर 2000). "The Real Prince Philip". चैनल 4. अभिगमन तिथि 23 सितम्बर 2009. ↑ डेविस, कैरोलिन (20 अप्रैल 2006). "Philip, the one constant through her life". द टेलीग्राफ. लंदन. अभिगमन तिथि 23 सितम्बर 2009. ↑ London Gazette: no. 38128, p. 5495, 21 November 1947. Retrieved 27 June 2010. ↑ "60 Diamond Wedding anniversary facts". रोयल हाउसहोल्ड. 18 नवम्बर 2007. अभिगमन तिथि 20 जून 2010. ↑ London Gazette: (Supplement) no. 41948, p. 1003, 5 February 1960. Retrieved 19 June 2010. 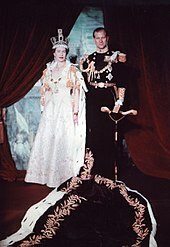 ↑ "50 facts about The Queen's Coronation". शाही राजघराना. 25 मई 2003. अभिगमन तिथि 14 अप्रैल 2011. ↑ "Queen and Australia: Royal visits". रोयल हाउसहोल्ड. अभिगमन तिथि 8 दिसम्बर 2009. 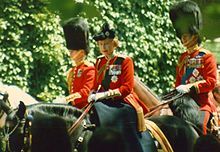 "Queen and New Zealand: Royal visits". रोयल हाउसहोल्ड. अभिगमन तिथि 8 दिसम्बर 2009. ↑ कैलैंड्स, साराह (25 अप्रैल 2006). 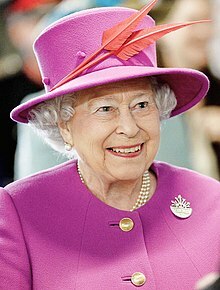 "Queen Elizabeth II celebrates her 80th birthday". सीटीवी न्यूज़. मूल से 16 अक्टूबर 2007 को पुरालेखित. अभिगमन तिथि 13 जून 2007. ↑ अ आ "Queen and Canada: Royal visits". Royal Household. अभिगमन तिथि 12 फरवरी 2012. ↑ डाएमोंड, ग्लेन (5 मार्च 2010). 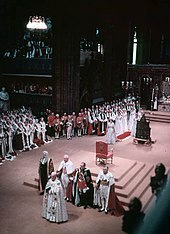 "Ceremonial in the House of Lords" (PDF). हाउस ऑफ लॉर्ड्स पुस्तकालय. पृ॰ 12. अभिगमन तिथि 5 जून 2010. ↑ "Public life 1962–1971". रोयल हाउसहोल्ड. अभिगमन तिथि 1 सितम्बर 2011. ↑ अ आ इ ई हेन्रिक्स, ज्यॉफ़ (29 सितम्बर 2000). "Trudeau: A drawer monarchist". नैशनल पोस्ट. टोरंटो. पृ॰ B12. ↑ "Queen's 'fantasy assassin' jailed". बीबीसी. 14 सितम्बर 1981. अभिगमन तिथि 21 जून 2010. ↑ "Annus horribilis speech, 24 November 1992". Royal Household. अभिगमन तिथि 6 अगस्त 2009. ↑ स्टैंगलिन, डॉउग (18 मार्च 2010). "German study concludes 25,000 died in Allied bombing of Dresden". यूएसए टुडे. अभिगमन तिथि 19 मार्च 2010. ↑ द इंडिपेंडेंटसमाचारपत्र के लिए मोरि का सर्वेक्षण, मार्च 1996, पिम्लॉट के पृ. 578 में संदर्भित और ओ'सुलिवान, जैक (5 मार्च 1996). "Watch out, the Roundheads are back". द इंडिपेंडेंट. अभिगमन तिथि 17 सितम्बर 2011. ↑ एल्डरसन, एंड्रयु (28 मई 2007). "Revealed: Queen's dismay at Blair legacy". द टेलीग्राफ. अभिगमन तिथि 31 मई 2010. ↑ एल्डरसन, एंड्रयु (27 मई 2007). "Tony and Her Majesty: an uneasy relationship". द टेलीग्राफ. अभिगमन तिथि 31 मई 2010. ↑ "Address to the संयुक्त राष्ट्र General Assembly". रोयल हाउसहोल्ड. 6 जुलाई 2010. अभिगमन तिथि 6 जुलाई 2010. ↑ अ आ "Queen addresses UN General Assembly in New York". बीबीसी. 7 जुलाई 2010. अभिगमन तिथि 7 जुलाई 2010. ↑ "Royal tour of Australia: The Queen ends visit with traditional 'Aussie barbie'". द टेलीग्राफ. 29 अक्टूबर 2011. अभिगमन तिथि 30 अक्टूबर 2011. ↑ "The Queen's Diamond Jubilee message". रोयल हाउसहोल्ड. अभिगमन तिथि 31 मई 2012. ↑ "Prince Harry pays tribute to the Queen in Jamaica". बीबीसी. 7 मार्च 2012. अभिगमन तिथि 31 मई 2012. 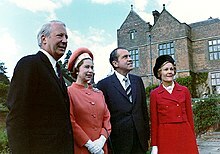 ↑ "Their Royal Highnesses The Prince of Wales and The Duchess of Cornwall to Undertake a Royal Tour of Canada in 2012". ऑफिस ऑफ द गवर्नर ज़नरल ऑफ कनाडा. 14 दिसम्बर 2011. अभिगमन तिथि 31 मई 2012. ↑ "The Queen's Diamond Jubilee in 2012". रोयल हाउसहोल्ड. अभिगमन तिथि 22 मार्च 2015. ↑ "Canada's Olympic Broadcast Media Consortium Announces Broadcast Details for London 2012 Opening Ceremony, Friday". पीआर, न्यूज़वायर. 24 जुलाई 2012. अभिगमन तिथि 22 मार्च 2015. ↑ निकोलस ब्राउन (27 जुलाई 2012). "How James Bond whisked the Queen to the Olympics". बीबीसी. अभिगमन तिथि 27 जुलाई 2012. ↑ "Queen honoured with Bafta award for film and TV support". बीबीसी. 4 अप्रैल 2013. अभिगमन तिथि 7 अप्रैल 2013. ↑ "Queen to miss Commonwealth meeting". बीबीसी. 7 मई 2013. अभिगमन तिथि 7 मई 2013. ↑ "Elizabeth Set To Beat Victoria's Record As Longest Reigning Monarch In British History". द हफिंग्टन पोस्ट. 6 सितम्बर 2014. अभिगमन तिथि 28 सितम्बर 2014. ↑ विलियम्स, केट (6 सितम्बर 2015). "The Queen's record-long reign has seen Britain's greatest time of change". द गार्डियन. अभिगमन तिथि 8 सितम्बर 2015. ↑ "Greeting a member of The Royal Family". रोयल हाउसहोल्ड. अभिगमन तिथि 21 अगस्त 2009. 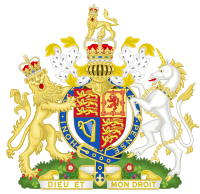 ↑ "Coat of Arms: Her Royal Highness The Princess Elizabeth". Lieutenant Governor of British Columbia. अभिगमन तिथि 6 अप्रैल 2013. ↑ "Personal flags". Royal Household. अभिगमन तिथि 21 June 2010. ↑ "Coat of Arms of Canada". रोयल हेराल्ड्री सोसाइटी ऑफ कनाडा. 5 फरवरी 2009. अभिगमन तिथि 13 मार्च 2011. क्रॉफोर्ड, मैरियन (1950). The Little Princesses. London: Cassell & Co.